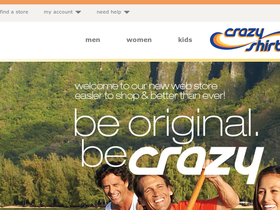 Crazy Shirts, online at CrazyShirts.com, is your destination for casual clothes for men and women. Crazy Shirts sells t-shirts, polo shirts, tank tops, jackets, sweatshirts, shorts, swim shirts, board shorts, and Canton pants. Crazy Shirts also sells zip jackets, Pima dresses, skirts, fashion hats for women, jewelry, and bags. You can also find mini t-shirts and Sharka key chains and other gifts at Crazy Shirts. RetailSteal.com has the best Crazy Shirts coupon codes, Crazy Shirts discounts, Crazy Shirts coupons, and Crazy Shirts promo codes. Shipping and handling rates at Crazy Shirts depend on the pricing of your purchase and your shipping destination. See website for full details, exclusions may apply. Enjoy free shipping on orders of $100+ when you shop at Crazy Shirts today and use this coupon code. Click to start saving. Save up to 70% off sale items when shopping online at CrazyShirts.com. Click to shop. Act now and save up to 30% off select dyed tees from Crazy Shirts. Choose from wine-dyed, beer-dyed, chocolate-dyed, and even key lime-dyed. Shop online at CrazyShirts.com and save up to 50% or more on sale t-shirts and apparel. Don't miss out on 70% savings on select shirts from Crazy Shirts. Click the link and start shopping today. For a limited time at Crazy Shirts, orders below $30 are shipped for the low flat rate of $6.95. Orders between $30 and $120 are shipped for $9.95. Click link to shop. Act now and enjoy free gift wrapping on select items from Crazy Shirts. Buy kids' t-shirts for only $12.60 when shopping online at CrazyShirts.com. Click to save. Check out the new arrivals online at CrazyShirts.com and save up to 25%. Click link to start. Shop online at fivefingertees.com and receive a mystery t-shirt for only $4.99. You pick the size, they pick the shirt! Save 10% on your purchase from Five Finger Teas. Click link to shop and use the coupon code to save.